With the untimely and sad death of Whitney Houston I decided to take a look at her chart, so many people have attributed her death and overall demise to her relationship and marriage to singer Bobby Brown. Myself included arrivied at this conclusion, but must retract my previous opinion as their simply is no evidence to support this theory. I’m fascinated with our connection to certain individuals. The ties that bind, that ride or die sort of love you read about in the papers or watch in the movies. I recall watching Whitney Houston on Oprah stating “he is my drug”, referring to Bobby Brown. I never believed for a second she was over him. After all some things in life you never really “get over” you may learn to live with them, you may put them away on your proverbial shelf but there always there lurking beneath the surface. Whitney has a sun in Leo opposing Bobby Browns Sun in Aquarius, this indicates a push pull not a harmonious aspect. But friction. The sun represents your identity and when 2 people come together that have a square or opposing suns this usually equals attraction but a strong need to adjust to one another. Her Aries moon makes her abundantly assertive, speak now think later, hot headed-ness comes with an Aries moon, passionate feelings run high with an Aries moon and their we have bobby with his moon in analytical Virgo. Emotions take a back seat with a Virgo moon. They process feelings, they are more mental based. You can imagine a fiery personality wanting to address issues right then and their, well not with a Virgo moon! They are the they type to “sleep on it” or talk about it after they have processed everything. Mars in a Woman’s chart is said to indicate the qualities a woman is looking for in a man and Venus in a mans chart is said to represent what he would like in a woman. We would also look to the ruler of the 7Th houses and several other factors. Here we have Whitney’s Mars in Libra, she is looking for a fair man, that is well balanced likes to shower her with nice things. While Bobby’s Venus is in Aries, he is interested in fiery, instant gratification. Aries is in detriment in Venus, due to the fact it is impulsive sometimes Aries will fall in love and have regrets, at times they cheat because they lack the ability to control impulses and I would say that was very likely with Bobby as he also has Venus Opposition Pluto Natal. And here we have their needs, what they seek in partners lying once again opposite one another. Adjustments are needed. They are at odds, Libra is all about partnership and Aries is all about self. Whitney has a loaded 7Th house, the 7Th house rules partnerships and not only does she have Mars The God of war in her natal 7Th house (arguments and aggression), Pluto which by house placement indicates where you will be greatly changed and where you do not have any control, Uranus is also in the 6Th house but conjoining the 7Th house cusp, shocks, rebellion, sudden changes… WOW this is quite a lot going on. Relationships will drastically change her, her entire life will experience upheavals through partnerships with others. And I do believe she would experience this no matter who she married. Virgo on the 7Th house cusp says she may have sought a man that was stable, that would take care of things, that she wanted a “perfect relationship” and as crazy as it may sound I do believe Bobby Brown Projected that, that “i will take care of things”. He has a Capricorn rising, that is the father figure of the zodiac. He also had that Virgo moon making him analytical. Everyone that studies astrology knows that when looking for addiction you look at the placement of Neptune and Pisces, Ive known many people that have grown up with alcoholic parents with Neptune sitting in their 4Th house. Much to my surprise their aspects combined did not have an abundance of afflicted Neptune aspects. Whitney has Pisces rising if this is indeed the correct birth time. This is common with individuals that struggle with addiction, most recently Demi Moore. Pisces are the last in the zodiac and are said to carry the pain with them from the rest of the zodiac. They can be impressionable, dreamy, helplessly romantic, in search of a partner to take over. Being ruled by Neptune they often suffer from illusions or escapist tendencies. With that being said Whitney was impressionable. Neptune the ruler of Pisces in her natal chart is Squaring her natal Venus, Neptune indicates what we do not see clearly and Venus is the planet of love meeting by square can indicate not seeing a relationship for what it is. Addicted to victim savior relationships. And here comes Bobby with his Virgo moon analytical not emotional, Capricorn rising indicates oddly enough someone that a Pisces rising may look to keep you grounded (Remember she cant see things clearly). And with his own Neptune trine Venus he could offer her a romantic love. I imagine he sang to her often. Next I went to Pluto for karmic ties that cause upheaval not much going on in the Plutonic Love division, lastly I went to Saturn. The experts state that Saturn will bind people together even when they want to be apart. Married for over a decade. Aside from Saturn aspecting a lot of their individual personal planets, they also have Saturn in one anothers 1st house. Not only will Saturn represent they repress one another, and lets be honest here Whitney has stated she went along with whatever Bobby wanted In her own words dimming her light to appease him and I’m pretty sure Whitney required Bobby attempt to give up his womanizing ways. Saturn represents restriction in which ever house it falls in. It also produces a strong sense of responsibility as Saturn is the father Planet of the Zodiac. They have heavy Saturn ties. This indicates even when you want to walk away you cant. Most notably Bobby’s Saturn Conjoining Whitney’s Moon, these are Karmic Ties this indicates a serious relationship. Then we have Whitney’s Saturn conjoining Bobby’s Sun. Saturn means serious business. For better or worse. When you impose 2 charts onto of one another you can see where you will effect another person. So we see that Bobby and Whitney each had Saturn in one anothers 1st house, indicating a serious and binding nature. Whitney’s Venus in Bobby’s 7Th house; this is my favorite placement for Venus. Bobby found Whitney attractive and he wanted to be with her. I like to think of Venus in the 7Th Theme Song as Always in my Heart by Tevin Cambell. It has a true forever love quality to it. Whitney’s Sun in Bobby’s 7Th; WOW Venus and Sun; the sun indicates Bobby saw her as a natural compliment. With the Sun in the 7Th you feel as though you can take on the world a ride or die sort of love especially paired with Venus. 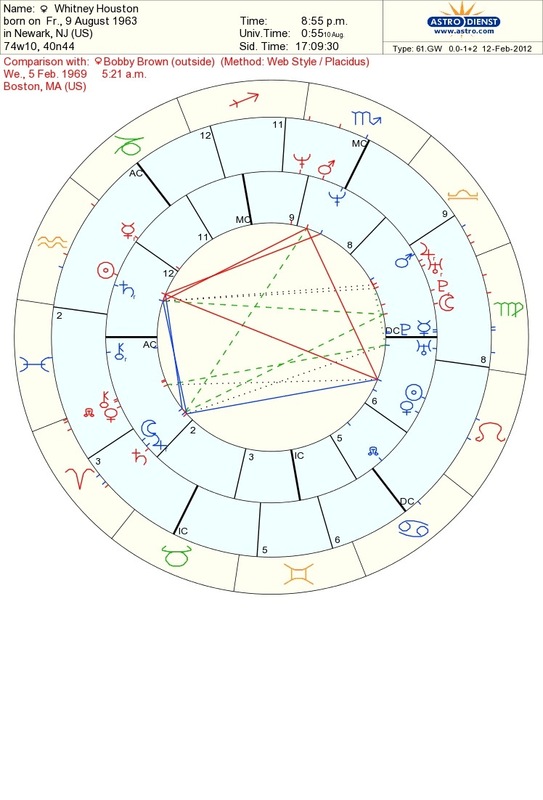 Bobby’s Pluto and Uranus in Whitney’s 7Th house:Remember Whitney has Pluto and Uranus here natally, this speaks volumes that their relationship will experience drastic changes. That he will complete change her, she will never be the same after her relationship with Bobby Brown. Whitney Houston was a great performer, I cried on the drive home last night listening to all of her amazing songs. I wondered how many people around the world were listening as well. The connection of people, the reminder that life is prescious, my facebook status yesterday prior to this was something along the lines of: sometimes we have to go to war with our demons and fight for our own happiness. Some battles are greater then others. 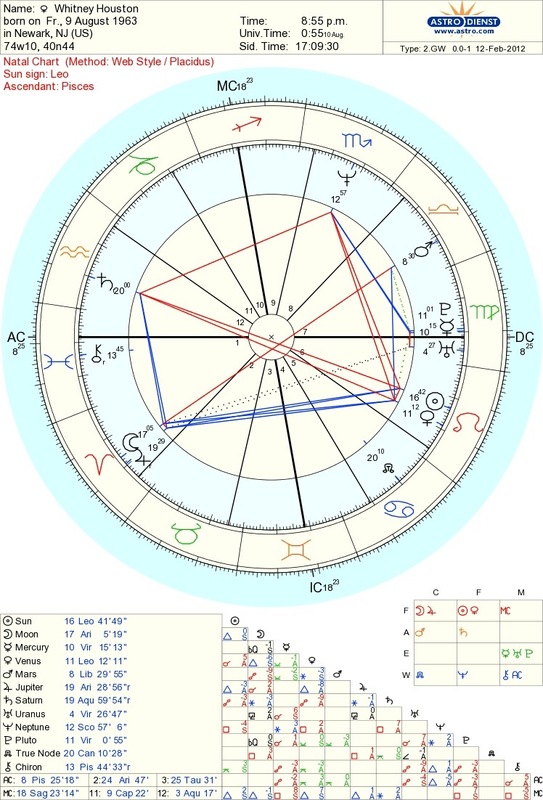 I looked heavily at Whitneys Chart, the natal, her progressed chart from the day she met Bobby at the Soul Train Awards back in the 1980’s, I reviewed her transits as well as her solar return chart but found no indication that she was a struggling with addiction or that Bobby Brown is some how at fault, what I did see in her chart however was a talented woman that was adored by the public as shown by her many contacts to the midheaven, Rest in peace Whitney, you will be remembered by the public as talented woman with the voice of an angel. Jupiter Trine Midheaven: You will have the opportunity to reach many, you will run in prominent circles.